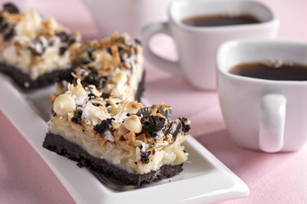 Guests will marvel at your powers: white chocolate, coconut and walnuts in an ooey-gooey bar with an Oreo Cookie crust. Grab one of your own before they disappear. Chop 8 cookies. Finely crush remaining cookies. Mix crushed cookies and butter; sprinkle onto bottom of 9-inch square pan. Layer with coconut, chips, nuts and chopped cookies; drizzle with condensed milk. Bake 25 to 30 min. or until center is set and top is golden brown. Cool completely. Looking for something sweet? One serving of this special treat goes a long way on chocolatey flavor.